Turn on the saute function on the slow cooker and set to low heat. Add olive oil, garlic and onion. Saute in the slow cooker for about 3 to 5 minutes until the onions are caramelized. Add uncooked brown rice, fresh rosemary and fresh thyme. Mix it all up and ensure that every grain of rice is covered in the seasoning. Pour in chicken broth followed by diced raw chicken breasts. Stir it up and pop the top. Cook on medium-high heat for 3 to 5 hours. When there’s about an hour left of cooking, stir it up then add Greek yogurt and cheese. Mix it up until it’s creamy. 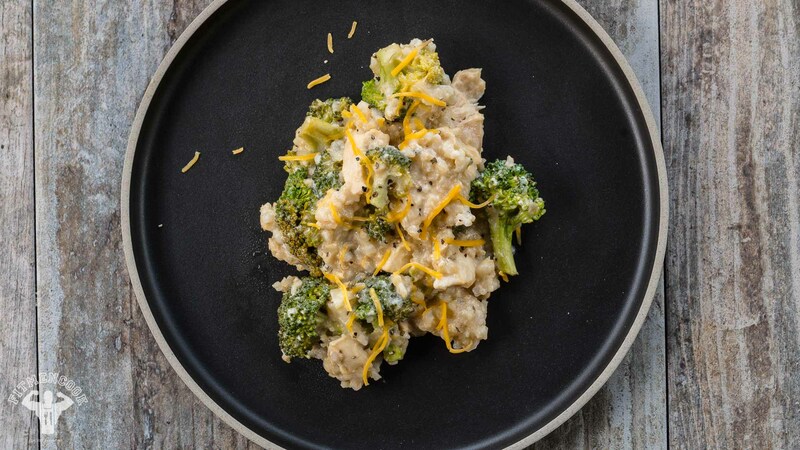 Place raw broccoli florets on top of the rice but DO NOT mix – let the surrounding steam soften them to ensure they are crisp tender. Secure the top and cook for remaining time. Season to taste with sea salt & pepper. NOTE: If you need to add more liquid, add tablespoons of chicken broth until you reach desired consistency.